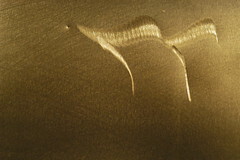 Here are the first of a series of images ground into steel. I did experiments with making gestural images in stainless steel, but they are hard to photograph since they generate a multiplicity of views depending upon the angle of the lights relative to the viewer and the image (examples to come). 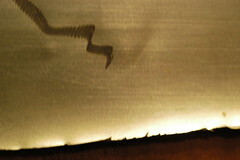 Below two images (the fish, the horizon scene) barely ground into the surface mill-scum of regular steel. Steel is harder than stainless and so the grinding is just on surface and therefore lacks the holographic quality of grinding into stainless steel. Below, drawings cut into stainless steel. 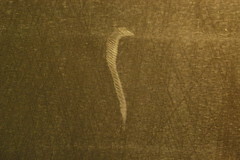 The drawings are shown in various lights; the first 3 images below show the same drawing under 3 different lightings. After that, each drawing is shown under 2 different lights. Lovely! The elegance and detail of a carefully mastered pencil drawing, and the vividness of a 3D model. Still as dead as a fossil; an element of a picture that don't have the same color when I look at it from different angels tend to be ghostlike and non living, which is reinforced by the steels small spectra. I'm very curious about how the photographs looked before they were made black & white(?). It is nice work. Blanchard ground steel does make an interesting canvas. Few people realize the inherent beauty in raw materials of industry. 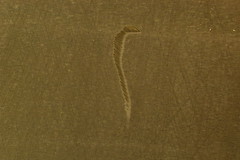 I have seen work by an artist freehand drawing scenes, portraits and landscapes, using a dremel tool on galvanized steel. This book http://www.amazon.ca/Colouring-Bronzing-Patination-Metals-Richard/dp/customer-reviews/0500015015> has encyclopaedic photographs of metal corrosion, quite beautiful. What a beautiful hyperbolic paraboloid. expressive than the computer graphics that we have seen over the years. to get a curve... I probably still would if I had more time. Very Interesting! I love the ambiguity. I see the forms in many contexts including biology, architecture and mathematics. What is the scale? Most of the images here are 50% to 80% of the actual size of the metal plate. There are also some much larger pieces, not published here. The stainless steel plate is 1/8" thick; the steel in the top 2 images is 1/4" thick. 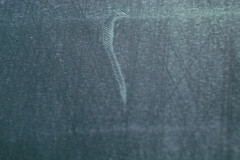 A variety of grinders are used to make the marks cut into the stainless steel. The working metaphors are gestural, calligraphic, rhythmic, and, for the long thin vertical piece, late Cezanne landscapes. The resulting pieces, to my eyes, evoke quietly ambiguous and shifting visual metaphors of contours, semi-transparent sea creatures, flying dreams, feathers, and mathematical topological models. However I generally see and evaluate the pieces mainly in abstract terms of shifting light/line/curves/intersections/negative space, not in terms of visual/verbal metaphors of representation. This implies that the piece may survive visually regardless of which side is chosen as the horizontal baseline. Sometimes the baseline is chosen to head off a corny and accidental metaphorical reading. The size of the framed negative space surrounding the cut steel, and the relation of the negative space to the cut steel, are very important in making a piece work. These are part of a series of table pieces or indoor pieces, an activity perhaps induced by the cold weather, which makes it difficult to work on the usual large outdoor pieces. These new pieces here are studies of surface texture, a variable that I have usually sought to calm down-- to reduce the expressiveness of the texture--in the large landscape works. All the images above are made by simply scanning the metal piece at various angles. The scanning is done in gray scale to avoid any arbitrary or accidental color casts, which can result from the over-sensitive insensitivity of color scanning and printing. 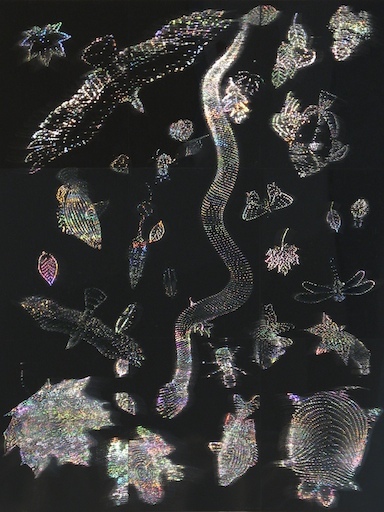 Multiple views for each piece are shown to demonstrate some of the holographic-like multiplicity of images produced by various angles of reflected light from the same piece. 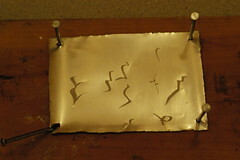 The final artwork can be seen either as prints (shown here, as the metal piece becomes an image generator), or as the metal piece itself. The actual metal pieces are much richer than any collection of scans or photographs. Someday full-color in situ photographs will probably be published here. Lovely, it is great to see this pictures! 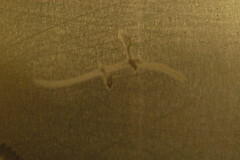 Have you ever tried to draw on bended metal or used an "damaged" glass-Cutter to add 2nd level nanostructures, similar to the ones found in bird feathers? The effects of "Anisotropic Reflections" due to nanostructures are amazing. See here for some other (less artistic) examples. The picture 28+35 show the effects especially well. My private name was "David Smith style." Thanks so much to Kindly Contributor O. Chatelain for identifying the phenomenon, which is most intriguing because it is what makes the multiplicity of views. It means not isotropic and is pronounced an-isotropic. anisotropic: Properties of a material depend on the direction; for example, wood. In a piece of wood, you can see lines going in one direction; this direction is referred to as "with the grain". The wood is stronger with the grain than "against the grain". Strength is a property of the wood and this property depends on the direction; thus it is anisotropic. See here for a good mathematical introduction about this effects. - ... using multiple (moving) light sources (white/colored LEDs or similar). 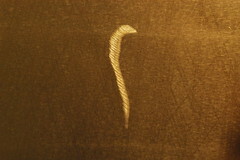 - ... scratching glass from two sides, eventually adding a reflective layer on the backside. - ... adding a multiple, very thin layer of transparent epoxy resin, scratching in a different direction. This may even lead to skin (lips) like effects. - "The pope's revenge" (a cross) on the TV tower of east Berlin. - Any reflecting hairs you see (Rastas will not work ;-). 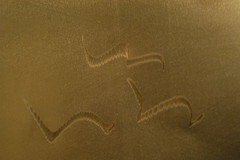 Here are more recent engravings in stainless steel. The gestural calligraphic effects are produced by changes in line weight as if the brush thins, disrupts, and concentrates ink. These two images, taken in our kitchen about a minute apart during the butter light of sunset, differ greatly, in part because of the three-dimensional reflections from the cuttings into the stainless steel. 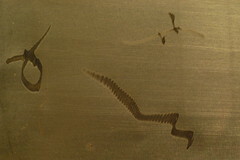 The second image shows some appropriately atmospheric shadows cast by bamboo onto the engraved plate. In these adjacent images: same piece, slightly different camera angle. These still-land comparisons don't capture the effects seen by an active viewer, who sees dynamic smoothly changing images as the light flows across the piece. Here is an engraved plate, 30 by 12 inches, or 760 by 300 mm, photographed in a pill-up of new and old artwork. Again note the change in the image according to point-of-view, which in fact is about the angle of the light on the piece in relation to the camera. These images appear small to my eye because the actual piece is quite large, when indoors at least. The recent images above are overly warm because the white balance on the camera was unintentionally set to sunlight, which then warmed up and exaggerated the halogen light on the pieces. The stainless steel is not really so golden, even in butter light and in halogen light. I prefer the cooler gray of stainless steel and so maybe I'll correct the color sometime. More recent work. 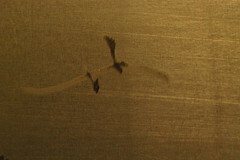 The first piece has soapstone markings placed on the engraved stainless steel. Below, some grinding on a new Bouquet piece. The hints of Art Deco in the surface go with the Art Deco steel edges. that flare up in sunlight. 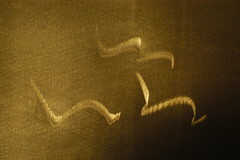 Here's an early experiment trying out grinders and grinding gestures on stainless steel. 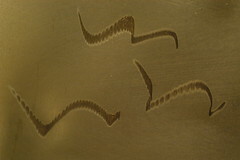 produce controlled and beautiful calligraphic effects on the stainless steel. a new mask, which draws air to then be filtered distant from the area producing the metal dust. Here are 2 new engraved pieces, shown under varying light and color adjustments. These 2 are part of a series on 12 by 30 in, or 30 by 76 cm stainless steel plate. because of its complexity and proportions. change in distance in real-land, or by zooming in and out of photographic flatland. Eamonn Keogh, our Kindly Contributor, opens up a world of precise and beautiful engraving of systematic patterns onto metal in the link above. Imagine using this technology for cutting a subtle Ben Nicholson relief into metal. In addition to amazing metal work, Eamonn Keogh is also a computer science professor at UC Riverside! Along with several colleagues, he has constructed rich visualizations of DNA and time-series. See "Visualizing the Similarity of Human and Chimp DNA." The time-series work, with sparkline-like overtones, is here. What steel engravings, engine turning, high-resolution multivariate time-series analysis, and sparklines have in common is an intensity of resolution--and trying to understand the visual information produced by intense resolution. What you said about the grinder calligraphy you have been doing lately reminded me of a page that describes how it is possible to make holographic images by hand by scratching a reflective surface. I see that you have described your work as "holographic," so perhaps you have seen it already. Notice that the author claims that the images are truly, not metaphorically, holograms. Below, a new piece, a stainless steel engraving (30 by 12 in, or 760 by 300 mm) with 3 calligraphic figures. Shown are 3 photographs taken from slightly different angles to the plate, which becomes an image generator. the borrowed light generates--or paints--a multiplicity of complex and subtle color shifts that would be difficult to create otherwise. Some bobcat (lynx rufus) scratches were found in the ice-snow at Hogpen Hill Farms. The bobcat urinated on the twig, and then did the usual back-paw scratching-cleaning-cover-up gestures. 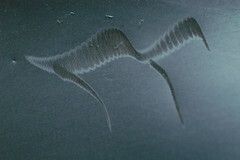 The result was this set of ice-snow anisotropic (see above) engravings. 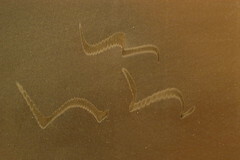 Several new engravings on stainless steel are shown below. and then gently adjusted globally in Aperture. possible... one can only embellish the flaw. Are there additional ways of harnessing this? suited to the task than an angle grinder? A disc grinder, with its size, the percessive force of its rotating motor, and directionality of rotation, imposes fairly severe constraints on the worker. A bamboo ink brush also imposes relatively severe constraints: the tool is unexpectedly light, the hand is relatively far from the point where tool meets surface, and the brush must be moved in certain directions relative to its angle with the paper. In contrast, a dremel flex shaft is a bit like the fine-tipped felt marker of grinding tools. Unless I'm doing fine polishing work on small surfaces, I leave mine in the toolbox. 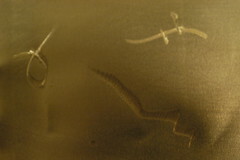 With both the grinder and the ink brush, the artist must plan a movement, predicting as best he can the consequences, but ultimately the outcome of tool on surface is predicted before the first visual feedback is available, that is, there is a lag in the motor-visual-motor feedback loop. Improvement comes with experience in the material, which improves the accuracy of the artist's predictions, and editorial decisions after a body of elements have been created. My Dremel tool has also remained in my toolbox since the day it was purchased. That said, I can't help but wonder if the larger version of the same concept would be useful? Higher resolution images are available here. Just enjoy them ... . Source: Toots Zynsky, represented by Barry Friedman Ltd.
Just thought I would suggest that it may be wise to test metal (or any material) scrapped from a nuclear facility for residual radioactivity. Once I obtained a radiation sensing device I was amazed by how many common articles radiate in interesting ways. On board a jetliner background exposure is much higher, and much early art glass work used various radioactive elements for vivid colors. Mineral specimens from exotic locales are often quite radioactive as well; in these cases breathing particulate debris is most dangerous compared to mere exposure to alpha radiation.